The Nerja Caves Festival celebrates its 50th edition this summer, and it’s been confirmed that one of Spain’s top singer songwriters will be opening this year’s event. 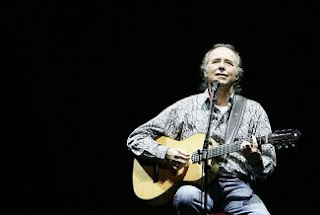 Joan Manuel Serrat will play at the Festival on Tuesday 21st July as part of his tour, ‘100x100 Serrat’. Prior to that, Serrat, now 65, plays another festival in Málaga: the 14th Festival Ciudad de Fuengirola in Sohail Castle on 10th July. He’s in the mediaeval castle of Peralada, Gerona, for their international music festival on the 27th, La Opinión de Málaga reports. Serrate is currently working on a new tribute record to the Orihuela poet, Miguel Hernández, to celebrate the 100th anniversary of the poet’s birth. He made a previous recording of Hernández’s poems in 1972. How will the Netherlands, dominated by water, be affected by future climate change? Dutch researcher Martin van Breukelen hopes to answer that question by analyzing stalagmites from the South American Amazon tributaries in Peru as a way to reconstruct climate changes in the past. Information that can be used to test climate models is stored in various forms: in ice formations, plant remnants, oceans and caves. Limestone formations in caves, so-called speleothemes, provide insights into the land climate. The best-known speleothemes are stalagmites, standing formations and stalactites, hanging formations. Van Breukelen discovered stalagmites in South America that provide information about the climate over the past 13,000 years. In order to study climate change, Van Breukelen analyzed the accumulation of oxygen isotopes in both the cave water and the stalagmite. A small quantity of fossil cave water is enclosed in the core of the stalagmite, so-called fluid inclusions. The entrapped water is just as old as the carbonate of the stalagmite in which it is trapped. The isotope ratio of this fossil water can be measured using an extraction technique. As this water has been entrapped for thousands of years it provides unique information about the climatic history. Much climate research on the land and sea is based on the measurement of subtle changes in the ratio between stable oxygen isotopes in, for example, ice or stone formations. Isotopes of an element can have different numbers of neutrons but always contain the same number of protons. Light isotopes (16O) respond differently to climate change than heavier isotopes (18O). Climate changes result in an altered ratio of the16O and 18O isotopes. The ratio of the different isotopic elements oxygen, carbon and hydrogen provides a lot of useful information about the climatic history. Van Breukelen uses this information to reconstruct the changes in temperature and precipitation. Climate research reveals that even without human influence the Earth's climate was changeable in the past. To what extent humans have influenced climate change since the industrial revolution remains unclear. It should be remembered that studies into climatic history can provide insights into the natural behaviour of the climate in the past. Additionally current climate models can only be improved if more historical data become available so that the accuracy of these models can be tested. The research method used by Van Breukelen that examines stalagmites is vitally important for climate research. This method allows the accurate reconstruction of independent temperature changes and precipitation patterns from thousands of years ago. Van Breukelen's research was funded by a grant from the NWO division WOTRO Science for Global Development. WOTRO focuses on funding innovative scientific research into development issues, especially sustainable development and poverty alleviation. Rescuers helped to get out a group of speleologists from St. Petersburg from a flooded cave in Crimea. QHA is informed about this by the press-cutting service of the Main Department of the Emergencies Ministry in the ARC. As reported, ignoring the warning of possible elevation of water level a group of 5 people walked down to Red Caves. Due to heavy rains the entry to the caves was flooded (he waterlevel rose about 1,5-2 m). As a result, 5 speleologists were blocked in this cave. The Russian tourists were rescued by scuba divers one by one. Rescuers had to dive at a depth of two metres and into a corridor of 30 m long. The rescue operation started at 11.15 p.m. and it ended at 5.00 a.m. Altogether 6 rescuers and 8 employees of Qızıl-Qoba enterprise were involved in the operation. Little brown bats with white-nose syndrome, New York. There is no known human health risk associated with WNS in bats. While the actual cause of WNS is unknown, scientists are reasonably certain that WNS is transmitted from bat to bat. However, WNS has been found in caves a significant distance from WNS-affected hibernacula, leading scientists to suspect humans may inadvertently carry the fungus from cave to cave where bats hibernate. "Although we have not seen this disease in Indiana, the responsible thing to do is close our caves to help slow expansion of WNS," said DNR director Robert E. Carter Jr. in announcing the decision. "Scientists need time to get a handle on the problem and solve it." The voluntary action is effective May 1 and closes public access to all caves, sinkholes, tunnels and abandoned mines on DNR-owned land, except Twin Caves at Spring Mill State Park. Twin Caves is able to remain open because it is a water cave with controlled boat access only and the WNS fungus settles in soil. The closure extends through April 2010 and follows similar steps taken elsewhere in response to a U.S. Fish & Wildlife Service advisory asking cavers to curtail cave activities in WNS-affected states and adjoining states. The Hoosier National Forest has closed all caves, as has Great Smoky Mountains National Park. White-nose syndrome, a wildlife crisis of unprecedented proportions, has killed hundreds of thousands of bats from Vermont to West Virginia and continues unchecked. Now, the U.S. Fish and Wildlife Service is asking those who use caves where bats hibernate - called hibernacula - to take extra precautions and to curtail activities to help prevent the spread of WNS. There is no known human health risk associated with white-nose syndrome in bats. While the actual cause of WNS is unknown, scientists are reasonably certain that WNS is transmitted from bat-to-bat. However, WNS has been found in caves a significant distance from WNS-affected hibernacula, leading scientists to believe that something else is moving WNS. "We suspect that white-nose syndrome may be transmitted by humans inadvertently carrying WNS from cave to cave where bats hibernate," said Northeast Regional Director Marvin Moriarty of the U.S. Fish and Wildlife Service. The Service's cave advisory asks that cavers curtail all caving activity in WNS-affected states and adjoining states to protect bats from the spread of WNS. The advisory also asks that cavers beyond WNS-affected states and adjacent states use clothing and gear that has never been in affected and adjacent states. And finally, cavers everywhere should avoid caves and mines during the bat hibernation period (winter) to avoid disturbing bats. In addition, federal and state scientists will evaluate all scientific activities in hibernacula for their potential to spread WNS, weighing potential benefits of the research against the risk to bats. "We are working closely with state natural resource agencies, the caving community, conservation organizations and other federal agencies on this issue," Moriarty said. "We understand that following these recommendations will inconvenience recreational cavers, but we believe this is the most responsible course of action as we face this unknown threat to bats, which play an important role in our world." Caves on state properties will temporarily close as a precaution against the uncontrolled spread of white-nosed syndrome (WNS), which is killing bats in record numbers in the eastern United States.